Heroin addiction like all opiate addictions occurs when heroin is administered over a sustained period of time. The onset of heroin addiction can be both rapid and severe, dependent on the amount used and frequency in a designated period of time. Heroin addicts will "crave" more of the drug and experience withdrawal symptoms if they do not get their regular "fix" or dose. Not all of the mechanisms by which heroin and other opiates affect the brain are known. Likewise, the exact brain mechanisms that cause tolerance and addiction are not completely understood. Heroin stimulates a "pleasure system" in the brain. This system involves neurons in the mid-brain that use the neurotransmitter called "dopamine." These mid-brain dopamine neurons project to another structure called the nucleus accumbens which then projects to the cerebral cortex. This system is responsible for the pleasurable effects of heroin and for the addictive power of the drug. Like other drug addictions, heroin can become the most important aspect of their lives. Heroin addicts often have habits that cost $100-$200 a day, which can cause addicts to quickly turn to lives of shoplifting, burglary, theft, drug dealing, and prostitution to support their habits. Methadone is a drug that has been used for several decades to treat heroin addiction by blocking heroin�s effects. Methadone generally entails the entire spectrum of opioid side effects, including the development of tolerance and physical and psychological dependence. A generation ago, the heroin (colloquially known as "smack") available in the U.S. was barely five percent pure and used by a relatively small percentage of young people because it had to be injected with a needle. Now, it appears smack is back with a vengeance and addiction to heroin is being experienced by large groups of new users. The Office of National Drug Control Policy issued a report (April 1992, No. 5, pp. 1-6) claiming "a massive increase in heroin use and addiction is not likely." One reason for this was, "...the apparent absence of new initiates (i.e., heroin users with little or no prior drug-using experience)." However, based upon recent news reports and other sources (see the A.T. Forum Web site for News Updates), the ONDCP report appears to have been premature, to say the least. Just this past February, Attorney General Janet Reno admitted heroin is more plentiful, purer, and less expensive than it was just a few years ago. "If we do not counteract the heroin threat now," she said, "we risk repeating the terrible consequences of the 1980s' cocaine and crack epidemic." Authorities estimate that heroin addiction has increased 20 percent and worldwide production has grown sharply, even as other illegal substance abuse is declining. Reports of problems have sprung-up nationwide. In California, heroin sold in the San Joaquin Valley is cheap, potent, and plentiful - business is booming in area emergency rooms as two or three overdose cases appear each day. In Colorado, Boulder County officials may establish a methadone clinic for the first time in 16 years to deal with increasing heroin addiction. On the East Coast, heroin is reported to be 40 to 70 percent pure and around $10 for a small packet. The number of heroin-related hospital emergencies has more than doubled in New York City and surrounding areas. Many drug abusers mistakenly believe inhaling heroin, rather than injecting it, reduces the risks of addiction or overdose. In some areas, "shabanging" - picking up cooked heroin with a syringe and squirting it up the nose - has increased in popularity. Street heroin carries prophetic names: "DOA," "Body Bag," "Instant Death," and "Silence of the Lamb." Rather than scaring off young initiates, the implied danger seems to actually increase the drug's allure. Marijuana use causing a reduction in social, occupational or recreational activities. 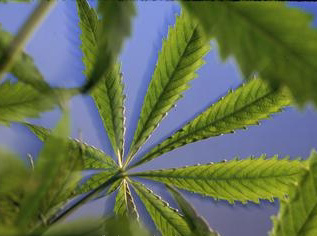 Continued marijuana use despite knowing it will cause significant problems. NIDA's Community Epidemiology Work Group (CEWG), an early warning network of researchers that provides information about the nature and patterns of drug use in major cities, reported in its June 1997 publication that methamphetamine continues to be a problem in Hawaii and in major Western cities, such as San Francisco, Denver, and Los Angeles. Increased methamphetamine availability and production are being reported in diverse areas of the country, particularly rural areas, prompting concern about more widespread use. Quarterly emergency room episodes due to stimulant use were tracked from 1994 to 1996. 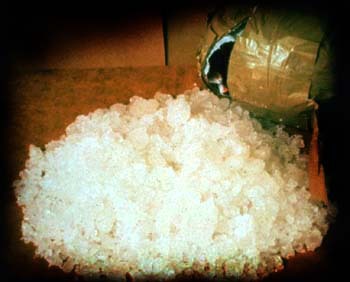 A shortage of methamphetamine was reported by epidemiologists during the last half of 1995 accounting for the significant decrease in ER episodes. Drug abuse treatment admissions reported by the CEWG in December 1996 showed that methamphetamine remained the leading drug of abuse among treatment clients in the San Diego area and was second only to marijuana in Hawaii. Stimulants, including methamphetamine, accounted for smaller percentages of treatment admissions in other states and metropolitan areas of the West (e.g., 5 percent in Los Angeles and Seattle and 4 percent in Texas and San Francisco). By comparison, stimulants were the primary drugs of abuse in less than 1 percent of treatment admissions in most Eastern and Midwestern metropolitan areas, except in Minneapolis-St. Paul and St. Louis, where they accounted for approximately 2 percent of total admissions. Methadone Hydrochloride is an opioid (a synthetic opiate) that was originally synthesised by German pharmaceutical companies during the second world war. It was first marketed as 'Dolophine' (to honour Adolph Hitler) and was used as an analgesic (a painkiller) for the treatment of severe pain. It is still occasionally used for pain relief. What are the symptoms of methadone overdose? As an opiate, regular use of methadone causes physical dependency - if you've been using it regularly (prescribed or not) once you stop you will experience a withdrawal. The physical changes due to the drug are similar to other opiates (like heroin); suppressed cough reflex, contracted pupils, drowsiness and constipation. Some methadone users feel sick when they first use the drug. If you are a woman using methadone you may not have regular periods - but you are still able to conceive. Methadone is a long-acting opioid; it has an effect for up to 36 hours (if you are using methadone you will not withdraw for this period) and can remain in your body for several days. ~I've been on both ends of withdrawals, heroin and methadone, every patient of methadone will always tell you the same, as I do; I can kick heroin anytime, but methadone that is something else. In 15 yrs of heroin addiction, I've kicked 3 times, 'cold-turkey'. In 10 years on methadone I've never kicked methadone. Once I landed in jail, I had to do 72 hours of jail time before I got to see the judge. I was literally on the floor screaming my guts out. About 12 hours before I was to see the judge, I demanded to be taken to the hospital, I just couldn't take it. 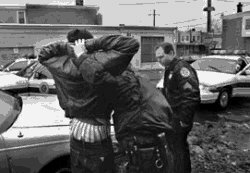 I was cuffed, and looking like a 'chair' was glued to my back, I limped to the ambulence, since I couldn't lift my leg to climb into the back, the police grabbed me on both sides and shoved me in like a sack of potatoes, I fell flat on my face. The doctor realizing my condition and that it was severe, gave me a shot of methadone. The relief was immediate. I was returned to the precinct and 2 days later I was in the same condition! Never did I go through such hell in all my days. The intensity of methadone withdrawal is just too much! I could never do it, by the way, about 5 years ago one inmate went into convulsions and upon falling, he hit the metal bars and died! ~On Sunday morning, March 30, I took my last dose of methadone. I have been on 80 mgs of methadone for the past 6 months. My doctor, an anesthesiologist, writes prescriptions for 125 tablets. This lasts 15 days. I signed a contract with him that basically says I will use the same pharmacy, I will not get meds from other physicians, and if I run out before the 15 days is up I just have to go without. I didn't mind signing the contract at all, and I have abided by all the stipulations. I called him for a refill on Friday. No response. I called again on Saturday. No response. I called his home on Sunday. No response. On Sunday I took my last dose. I hate anything having this much control over me. I find it very demeaning to be so dependent on a bottle of pills. On Monday I called his office. They informed me that he was on vacation this week. Panic descended . . . and so did withdrawal symptoms. At first I just got kinda nervous, jittery. My doctor has told me that methadone is not addicting. That is contrary to everything and anything I've ever heard or read about the drug. I never questioned him why he thought methadone wasn't addicting. I was hoping I'd never have to find out. What my body went through for the next 48 hours was one severe blow after another. I kept trying to tell myself I just had the flu. Just crawl in bed for 3 days and sweat it out. Of course I knew this wasn't true but I was going to play whatever mind game it took to get me through this. After the jitters, the muscle contractures started. It felt like the muscles in my legs and then in my arms were like rubber bands, being stretched and pulled to their max and then constricting to a shape that wasn't natural. Then came the sweats, diarrhea, hallucinations. I remember trying to dial the phone. It was a number I've called a thousand times before, only now I couldn't remember it. For that matter, I couldn't even hold the phone . . . I kept dropping it. My muscles were out of control. The pain that led me to methadone returned with a vengeance. In a strange way it was like an old friend. I knew it well and understood it completely. The combination of withdrawal and pain was too much. The all too familiar thoughts of suicide were returning. It was now Tuesday morning. I called the pharmacist and explained the situation. By 1:10 PM I had 8 methadone tablets. I took the entire dose at once all 8 tablets. Within 2 hours my muscles had stopped screaming, my head was beginning to clear, and the pain was lessening. It's now Thursday morning. I'm still not back to myself . .. . but much better. The assault on my body was indeed very traumatic . . . I lost 7 pounds and am still very shaky. Addiction is indeed a dangerous thing and should be avoided. I must admit when I was in the throes of withdrawal there's not much I wouldn't have done to relieve the symptoms. What are the dangers of methadone? Methadone is not an innocent substance; 'one's methadone maintenance dose is another's poison' (2). A regular user of opiates develops a certain tolerance. Therefore, it is possible that a tolerant person can function normally with dosages which can be fatal to a non-tolerant person. Also, methadone dosage in the case of first entry to the programme has to be evaluated carefully. It is wise to begin with a low dosage that has to be increased slowly in the course of weeks or even months. At entry to the programme it has to be carefully evaluated whether a patient has a clear and unambiguous heroin dependence. In methadone maintenance programmes, methadone is dispensed to tolerant persons, moreover, this tolerance remains high because of daily use of methadone. Therefore, it is not surprising that deaths at the King's College Hospital caused by methadone were not those of participants of a methadone maintenance programme but were those of 'recreational' users of illicit methadone. In cases where more than one drug is used, the drug responsible for death due to overdose is difficult to establish. Moreover, the same drug prescribed by physicians can also be bought on the street. In seventy percent of the deaths due to overdose studied in Glasgow and Edinburgh a combination of different drugs was found (3). Prescribed drugs such as temazepam were often encountered in deaths in Glasgow. However, among only 14 of the 34 persons who died in 1992 and where temazepam was found, this was prescribed by their physician. Because of the presence of other drugs it is not clear whether temazepam really caused the death of these people. Probably the combination of these different drugs was fatal to them. This was also the case with the methadone deaths in Edinburgh. However, in Edinburgh, the authors could not determine whether methadone was prescribed or not. Both Hammersley and Obafunwa report that heroin/morphine deaths seldom occur in Edinburgh (4). 'The fall of the deaths due to overdose in the Lothian and Borders Region of Scotland (LBRS) after 1984 reflects in part the strict policing that took place, in particular in the Edinburgh area'. 'The increase of methadone deaths is probably due to the introduction of a street trend to use this agent as a substitute to heroin'. The author suggests that methadone deaths are mainly caused by the use of illicit methadone. Therefore, these figures suggest that participants of methadone programmes are at lower risk of death due to overdose. However, this does not mean that methadone is an innocent substance. The high and increasing number of methadone deaths in Britain is alarming and certainly needs more attention. The first priority should be to establish whether the methadone causing death has been prescribed within a methadone programme or bought on the street. It also should be evaluated at what point during the course of the methadone programme death takes place. Further instruction doctors prescribing methadone could be necessary. The use of non-prescribed methadone without medical supervision can lead to high risks, especially when it is used as a substitute for heroin in order to get a 'high' instead of to prevent withdrawal symptoms. Physicians have to be aware of this danger and they should make sure that the prescribed methadone (as well as other psycho-active drugs) does not end up in the 'grey market'. Researchers have found that cocaine stimulates the brain's reward system inducing an even greater feeling of pleasure than natural functions. In turn, its influence on the reward circuit can lead a user to bypass survival activities and repeat drug use. Chronic cocaine use can lead to a cocaine addiction and in some cases damage the brain and other organs. An addict will continue to use cocaine even when faced with adverse consequences. Cocaine and crack cocaine continue to be the most frequently mentioned illicit substance in U.S. emergency departments (ED), present in 30% of ED drug episodes during 2001. 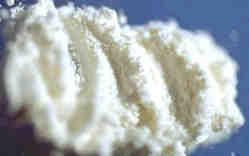 From 2000 to 2001, the number of ED cocaine mentions increased ten percent from 174,881 in 2000 to 193,034 in 2001.